Rangers International FC, an ambitious but somewhat underachieving club from Enugu, are currently number seven in the Nigeria Premier League 2010-2011. However, the club has some of Nigeria’s finest talents, including strikers Uche Nwafor (born 28.02.1989) and Brendan Ogbu. The player that has been feeding the sharp shooting striking pair with creative passes is the highly gifted central midfielder Chinedu Sunday, a coming man of Nigerian football. Sunday played for Ranchers Bees FC of Kaduna in the Nigeria Premier League 2009-2010 and made a huge impression despite the relegation of his club. Sunday caught the eye of bigger clubs and he joined Rangers International FC during the mid-season transfer window. Sunday needed little time to force his way into the first team of his new club. In September 2010, Sunday predicted a good season for Rangers International FC. He revealed that his personal goal was to force the national selectors of the Nigeria U-20 national football team to look his way. Sunday started the season brilliantly, claiming a regular starting berth at Rangers, which kept more experienced performers rooted to the bench. In November 2010, MTN Football wrote that one of the bright spots for fans of Rangers International FC was the “emergence of young playmaker Chinedu Sunday”. On 02.01.2011, Sunday scored his first ever league goal in the Nigeria Premier League, apparently a result of a goalmouth melee. 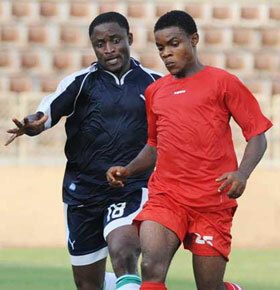 A few days later, Sunday achieved his goal and was named in a preliminary squad of the Nigeria U-20 national football team, preparing for the African Youth Championship that was supposed to be played in Libya in March 2011. The tournament will probably go ahead later this month if the North-African country is stabilized and Sunday will be hoping for a place in the official Nigeria U-20 squad, although competition is tough. Sunday is a very creative and skillful midfielder – the kind of player fans tend to idolize. He is fondly called “Messi” by the fans of Rangers International FC. Sunday is a typical playmaker, previously referred to as a “midfield maestro”, but will have to work on his physique as he is rather small, sometimes being described as “pint-sized”. The picture is taken from MTN Football. Sunday is the player in red.